Xenoy® Safety Padlocks are designed exclusively for Lockout/Tagout applications by safety directors. Distinctive Xenoy® safety padlocks are durable, standardized, substantial and identifiable for OSHA 1910.147 compliance. Padlocks weigh only 4 ounces, making them easy to carry large amounts. They provide excellent corrosion resistance and are temperature tested from -70°F to +350°F. Sealed keying system ensures your safety lockout system stays pure by preventing haphazard rekeying and the accidental introduction of duplicate key codes. Your facility's padlocks can be key charted to ensure no duplicate keys numbers are supplied and accidentally handed out to multiple employees. 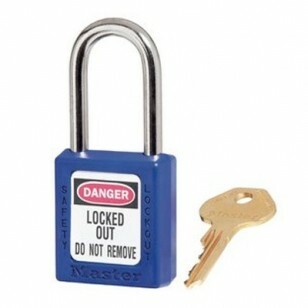 Box includes 6 each blue padlocks.